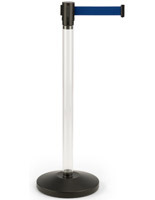 These clear stanchions grab the attention of any one waiting in line. 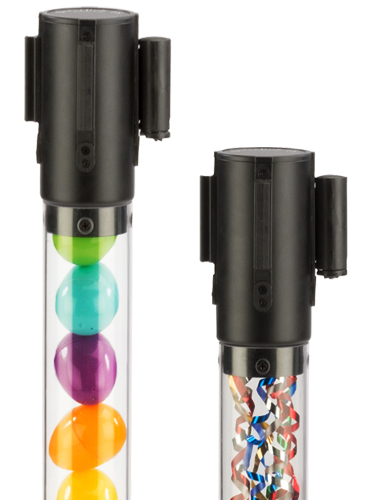 Each crowd control fixture features a hollow plastic tube that can be filled with a number of objects such as candy, toys, keychains, streamers or anything that is visually grabbing! 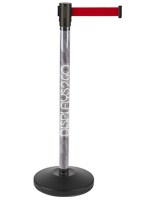 Alternatively, users can buy clear stanchions, or fillable queue poles, with a custom graphic lining for conveniently promoting their business. Also shown here are barrier accessories that can be used to dispense merchandise samples and other promotional materials. 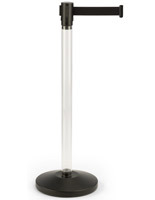 The clear stanchions with a retractable belt are available in a variety of options for use in any business. How can these fillable queue poles be used? 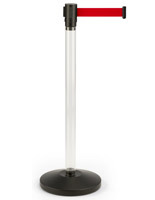 Businesses come up a number of creative ways to display these stanchions. Any company that needs to manage a line can use these posts to spice up the workplace. Dentist's offices can fill them with toothbrushes and floss. Stores can decorate their register lines with seasonal items like Easter eggs in spring or pencils during back to school season. Party supply shops can adorn their barrier stands with streamers while toy retailers can fill them with building blocks and other small objects. There are so many ways a business owner can utilize these fillable queue poles with a retractable belt! 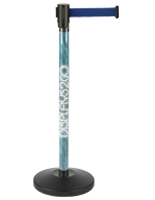 Some plastic stanchions we offer here come with a printed graphic that can advertise a logo or promotional messaging. This vinyl poster fills the height of the stand wraps all the way around the inside. These clear posts for crowd control can advertise to customers while they wait and can inform them about new merchandise, services or special offers. The plastic barriers are compatible with the top-mounted accessories shown here. 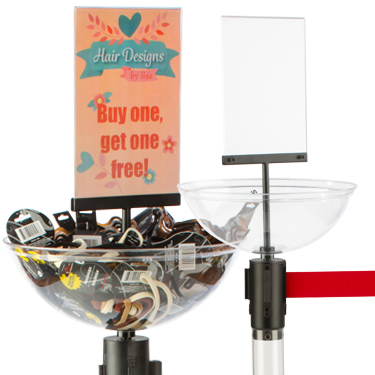 This includes a see-through bowl and sign frame that can hold giveaways and sellable goods. With the clear posts, users can place these items both in the tube and the holder on top. 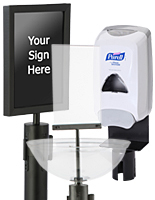 With sign frames, customers can be directed where the line starts or they can feature promotional messaging. A brochure holder is also featured here for dispensing literature to patrons as they wait for service. While they feature a hollow tube design, each plastic stanchion has a heavy concrete base for extra stability in high traffic environments. 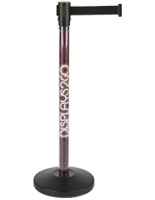 This type of fillable queue pole is great for banks, offices, retail stores yet they can also be brought to trade shows to attract passersby to an exhibit booth. The crowd control barriers include a retractable belt in a number of bold colors that can contrast with branding and fit in any environment. Each one of the fixtures also features a 4-way adapter for connecting to other units.